1/4 beef patty, sweet & spicy beef chili, topped with house slaw - extra napkins no charge! In the spirit of the great three-ingredient classics, we bring you a menu of new cocktails, just three ingredients each, which, together are more than the sum of their parts. Blended Scotch. Sweet Vermouth. Orgeat. Dry Vermouth. Yuzu Sake. Aperol. Sherry. Green Chartreuse. Torino Vermouth. Cane Sugar. Spices. Kola Nut. Cinnamon. Rye. Cola Syrup. Malic Acid. Molasses. Light grassiness. Vanilla Cocoa. Dry. Earthy agave. Oak. Sweet Almond. Spices. Anejo Tequila. Orgeat. Citric Acid. Located on Main Street in Beacon, New York Meyer’s Old Dutch Food & Such is a fun and casual, modern interpretation of the classic burger joint with a full-service bar. We use only the finest ingredients including local food purveyors such as beef from the Hudson Valley, cheese from NY state and produce from local farmers – together with our family micro farm in Hyde Park. Our full-service bar features a large selection of NY craft beer, locally produced wine and house-crafted cocktails. 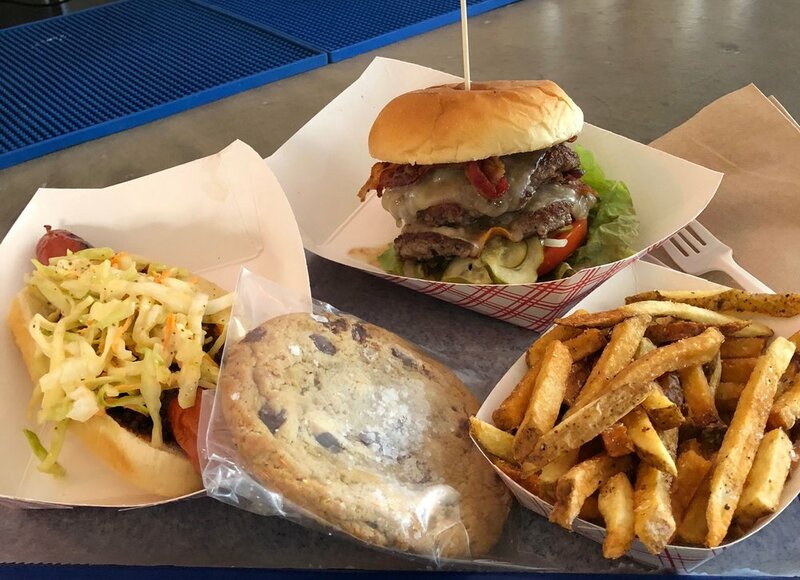 In addition to beef burgers, the menu offers lamb, chicken and vegan options with multiple toppings and house-made signature sauces, plus hand-cut fries, sweet potato fritters and salads. All items will be available via counter service and served in open seating and a back open-air patio. Check out News & Notes on M.O.D. When the opportunity arose to move to Washington, D.C., Brian began planning his first business, a macaroni and cheese food truck. Brian opened CapMac, one of the first food trucks on the DC food truck scene, in November, 2010. His mac and cheese creations received rave reviews and CapMac soon became a DC institution, with mentions and awards from the Washington Post, The Washingtonian, Southern Living Magazine, Thrillist, Zagat and more. After three and half years in business Brian sold CapMac with an eye on returning to the Hudson Valley. During the summer of 2015 he opened Kitchen Sink Food & Drink a casual, fine dining restaurant in Beacon. 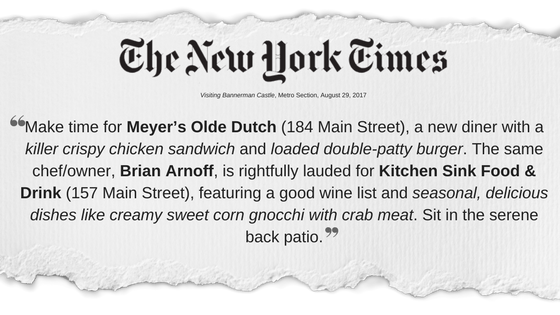 In June of 2017 he opened Meyer’s Olde Dutch which has become part of the local scene in Beacon, and is a great part of the revitalization of the charming Hudson Valley community. Brian and his wife, Jaimee, reside in Beacon. I went to high school in Peekskill then I went to Johnson and Wales University in Providence, Rhode Island. While I was there I helped open a wine bar in town where I worked for two years while attending school. After graduating I moved back to the area and took a job at the Roundhouse where I worked for three and a half years. After that I worked at The Hop. I saw an ad on Craigslist for a position at Kitchen Sink where I worked for about a year until the opening of Meyer’s Olde Dutch. Teaching. I enjoy teaching people new stuff and seeing them learn it and execute what they’ve learned. It’s great seeing a new person grasp a concept and then make it his or her own. My son. He wakes up, I get up! Watching TV all night. I particularly enjoy old episodes of Iron Chef. I’ve played the trumpet for a long time. In high school I played in a band. If time and money were no object where would you go on vacation? Japan and Italy. Art and food are both revered in those countries. I am very interested in their cultures that are very different from our culture. Metal keeps me going. It makes me get up and gets my blood flowing. It has to be loud!